At the beginning of November, Venezuelan President Nicolas Maduro called for ‘a revolution’ within the police and a purging of the state security forces. His comments came after a Caracas police officer was implicated in the brutal assassination of a Chavista politician and members of a collective in the capital were shot in cold blood by police. The two events illustrate just some of the problems facing the country’s PSUV government as it attempts to build socialism in the face of vicious counter-revolution and tackle the endemic corruption and violence that are the legacy of years of neo-colonial government prior to 1998. Sam McGill reports. On 1 October, PSUV activist and national assembly member Robert Serra was stabbed to death in his home alongside his partner, Maria Herrera. His bodyguard, a Caracas police officer, later confessed to allowing the six murderers into Serra’s apartment. According to Venezuela’s Justice Ministry, a Colombian/Venezuelan paramilitary, Leiva Padilla Mendoza was paid $250,000 – by whom, it is not clear – to organise the killing. He was arrested by Interpol in Cartagena in early November and is now in prison in Colombia. Other sinister opposition links with Colombian paramilitaries suggests that the murder of Serra was just the tip of the iceberg. In September, Venezuelan television showed videos of two Venezuelan opposition activists, Lorent Gomez Saleh and Gabriel Valles, who operated out of Colombia after training at a military college in Bogota. In the videos, the two men discuss plans to use $8,000 of explosives to attack bridges, banks and government buildings in the Venezuelan border state of Tachira. Saleh mentions meetings with former Colombian President Alvaro Uribe and his links with Venezuelan opposition leader Maria Corina Machado. Saleh refers to buying firearms for a 48-hour killing spree in Caracas with a list of 20 targets, one of whom was Robert Serra. ‘We have to have all of the vests and rifles ready’, Valles is heard to say, ‘as well as the diplomatic cover.’ Saleh and Valles now face lengthy gaol sentences in Venezuela, having been deported from Colombia. However, it is clear that a well-funded terrorist network between Venezuelan opposition groups and Colombian paramilitaries exists, determined to destabilise and overthrow the Bolivarian revolution. The PSUV also revealed that in October further potential assassinations had been foiled against Education Minister Hector Rodriguez and National Assembly president Diosdado Cabello. In the same month, an arson attack was carried out against the headquarters of the Communist Youth of Venezuela. Attempts to subvert the building of socialism in Venezuela come in many forms; the most insidious can mimic truly popular and revolutionary movements. Recent events involving the so-called ‘Shield of the Revolution’ collective in western Caracas show this. 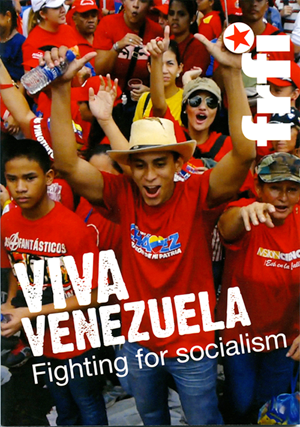 Venezuela’s collective movement is the backbone of the Bolivarian Revolution; the collectives – some autonomous, some directly linked to political parties and trends – are a form of community organisation by and for the working class, for political education, developing new collective ways of living, working and of defending the Bolivarian Revolution – with arms if necessary. An example is the Alexis Vive collective in Caracas’s revolutionary 23rd January barrio. But inevitably, there are also criminal or counter-revolutionary elements who can use the apparent autonomy of the collective structure to further their own ends. One such organisation seems to have been the Shield of the Revolution, led by Jose Odreman. It was part of the ‘5th March’ collective formed in 2013 by a number of retired police officers from the corrupt Metropolitan Police force, which was disbanded in 2011. Other community organisations accuse ‘5th March’ of involvement in robbing, kidnapping and killing local people. Last June, ‘5th March’ was banned from the 23rd January barrio for kidnapping and torturing a community activist. On 7 October, CICPC special intelligence officers shot dead five members of ‘Shield of the Revolution’ – including Odreman – after an eight-hour stand-off. The CICPC had reportedly been investigating a homicide and was confronted by members of the collective who took three officers hostage. The private opposition media leapt into action, showing Odreman’s dead body again and again, lambasting the CICPC for operating like ‘hitmen’ and laying responsibility for his death at the feet of Justice Minister Miguel Rodriguez Torres. The private media is using the Shield of the Revolution incident to portray all collectives and indeed all working class organisation as synonymous with violence and lawlessness. The reality is that Venezuela’s collectives and communal councils have developed as key organs of participatory democracy for the organised working class and oppressed. This is why the bourgeoisie wants to destroy them. However the role of the police has come in for criticism from Chavistas as well as from the opposition. Former vice-president Jose Vincente Rangel said that ‘assassinating members of a collective rather than detaining them’ was ‘unacceptable in a democracy’. He called for the government to adopt exceptional measures, to prevent the police acting with impunity – as they were famed for doing under the pre-1998 administration, the Fourth Republic. Rodriguez Torres resigned, whilst President Nicolas Maduro pledged a full investigation to ‘correct all that is wrong’ in the police, creating a presidential commission to improve political control and communication between the Ministry of Justice and the various forces. This will not be easy. Despite the creation of the National Bolivarian Police in 2009, police forces are still fragmented across regions, agencies and political control. In addition to national forces like CICPC and DISIP (counter-espionage agency), Venezuela has 23 states, each with its own police force answerable to the state’s governor, whilst many municipalities also have their own forces, answerable to local mayors. The commission will be led by Freddy Bernal, PSUV leader and former police chief with historic revolutionary credentials. He is charged with transforming the police, purging corrupt personnel, raising professional capabilities and organising a community body working in neighbourhoods to construct a new police model. In addition, pay and welfare provisions for police and the armed forces will be improved, to help prevent corruption and bribery. The contradiction at the heart of Venezuela’s police is bound up in the question of the state. Venezuela is a battleground for socialism in which revolutionary forces have gained considerable political power over the state apparatus; yet on the one hand the bourgeoisie retain immense economic power and on the other, despite the building of popular and inclusive movements, a tradition of individualism, graft and corruption still pervades society. The extent to which collectives like Alexis Vive are involved in constructing a new policing model will be crucial in determining its success. The Bolivarian militias are voluntary people’s defence organisations created by Chavez in 2005, today numbering around 130,000 volunteers.